As I wake up in my hotel this morning I have the opportunity to reflect over the last week. One common thought continued to enter my head throughout this week. Balance. When I am on the mat I have the ability to twist into a pretzel and balance on one leg. I can also kick up into a nice headstand. We all have those days though that we fall, and we all have new balances to face and learn. There are several types of headstands, there is handstand, and then there are forearm balances. The future has an infinite number of postures to learn new things and ideas. How do we find balance? I am focusing on balance in my life. I am finding it is best to try to apply it to everything. With my diet this week I had Meatless Monday, no coffee Tuesday, lots of fruit Wednesday, and vegan Thursday. Friday, Saturday, and Sunday I did not have any rules. This week gave me awareness of things I was putting into my body, but also gave my body a slight break from the every day routine. I had to search for new foods to put into my body. I am a believer that if I continue to put the same thing in my body everyday that it eventually becomes harmful. Outside of diet and yoga there is still a lot of balance to be found. There are 24 hours in our day. How do I balance these hours. Lately for me it is filled with sleep, work, yoga, art, and eating. All of us find our time shifting to one avenue or another. We look for a balance in our daily routine. So if I woke up at 8:00 am and worked from 9:00 am - 5 pm, then I come home walk the dog, do yoga at 6 pm, come home cook dinner, relax for a bit and then go to bed. 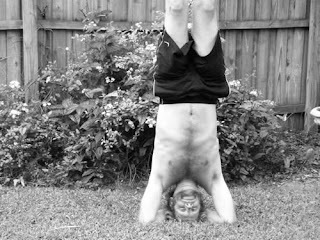 This is a perfect balance (I can stay in headstand with complete stability). To me though this is where we stop growing. We start to grow when we try something out of our stable life. When we add something new or drop something old from the program. This is when we start to feel unstable and search for our balance. Only you know when you feel stable in the headstand. Only you know when it is time to try the handstand. The people around you will help in gaining this balance. Are you trying to keep your balance or are you trying to keep or control the balance of others? Surround yourself around people who are trying to gain their own balance and also encouraging you and there for you when you loose your balance and fall down. I am keeping my balance in check. I do not expect a simple life. I expect both chaos and simplicity in my life. It's how I balance these two out that will keep my life at peace. Keeping the balance between the yin and the yang, the sad with the happy, the crazy with the simple, the work with the relaxation, the giving with the receiving. It is a constant struggle with keeping this balance. Find your balance and you will attract and find balanced people. If you are unbalanced you will attract and find the opposite unbalanced. If you always give, you will find the person who will always receive. If you are always working, you will search for the person who is always relaxing. If you are always sad you will search for the person who is always happy. This is an unfulfilled balance. You are the one who is always giving, working, or sad. Other people cannot fill this void, you have to find a way to fill this void. You need to find your balance. 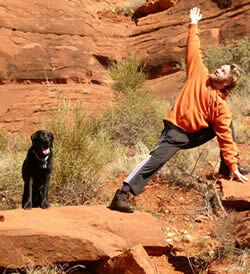 I am finding more and more how much balance in yoga is important in my life. This is where I learn how to breathe, stay in control, and ultimately find peace when life is unstable. I have the option to go into a balance that I know I am stable in. I can go into a new challenging balance where I can start to learn how to turn my chaotic unstable feelings into something I can control and feel stable again. Learn to grow.